front door to protest temporary layoffs during the economic slump. 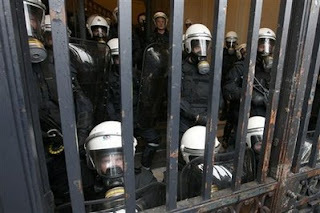 While the company held its annual shareholders' meeting, some among the 1,000 workers from Belgium and France hurled cobblestones and steel fencing at the building, which riot police lined up to protect. One protestor broke into the building and between 20 and 30 others fought police at the entrance. Journalists were told to leave the ground floor and go out a back entrance as smoke filled the halls. Privileged folk need to drop their pretenses and express their righteous anger at system vampires, and support the righteous anger of oppressed groups; those experiencing poverty, people of color, queers, etc. Essentially, I maintain that viciously fighting back has much better odds of winning real change then wringing your hands over a 'jack and ginger'.